On a cold December morning in 1942, 49 scientists and some guests gathered under abandoned viewing stands of the Stagg Field football field. The graphite and uranium pile in front of their balcony didn’t offer a great sight, but everybody was staring at the controls anyhow. Leona Woods, the only female physicist in the Chicago Pile-1 team, called out the countdown in a loud voice. After several false starts that day due to minor problems, the pile reached criticality in mid-afternoon with “the first self-sustaining chain reaction” as a commemorative plaque says – the dawn of the nuclear age. Nobel laureate Eugene Wigner had brought a bottle of Chianti that the scientists shared in paper cups after the very first nuclear reactor had been safely shut down. No ‘big bang’ happened, but history had been written: the beginning of the nuclear age. After this first successful run, Nobel laureate Arthur Compton called James Conant, chairman of the (then superseded) National Defense Research Committee NDRC with the good news. In this conversation, both men used an impromptu code. Compton said: “The Italian navigator has landed in the New World.” Conant asked: “How were the natives?”, the answer was: “very friendly”. The Italian navigator was Enrico Fermi, head of the Chicago Pile-1 team – an excellent theoretical and experimental physicist, originally from Italy. His work on neutron bombardment of elements, especially on the reacitivity of slow neutrons, had won him the 1938 Nobel Prize in Physics at the age of only 37. After the award ceremony in Stockholm in December 1938, he didn’t return to Italy with his family but embarked on a boat to New York. His wife, Laura Capon, was of Jewish origin and threatened under the new Italian Racial Laws. 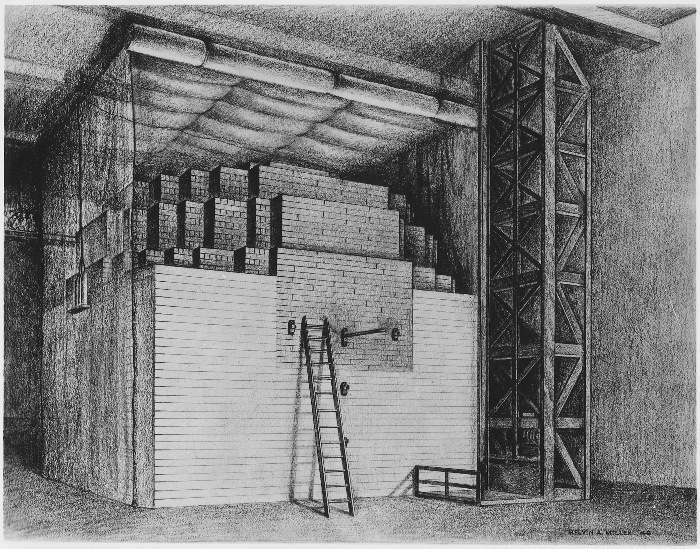 The ‘pile’ in Chicago consisted of 360 metric tons of graphite, used as a neutron moderator to slow down neutrons, 45 tons of uranium oxide, and 5,4 tons of uranium metal. To enclose the uranium in graphite, uranium layers alternated with graphite layers, starting with the latter. 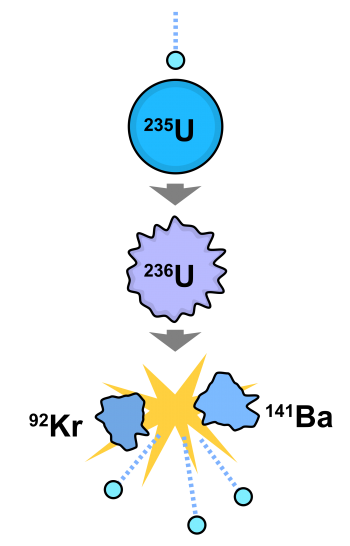 The idea was that free neutrons from the natural decay of uranium would be absorbed by other atoms, causing them to fissure while releasing more neutrons, plus the binding energy (see graph). Leona Wood had developed a boron trifluoride neutron counter that was placed at the 15th layer of the pile – without this counter, the researchers couldn’t know whether their experiment worked or not. Almost twenty years earlier, Fermi had studied Einstein’s theories of relativity extensively – and was the first to realise that hidden in Einstein’s famous formulas was an enormous amount of nuclear potential energy. “It does not seem possible, at least in the near future”, Fermi wrote in 1923, “to find a way to release these dreadful amounts of energy – which is all to the good because the first effect of an explosion of such a dreadful amount of energy would be to smash into smithereens the physicist who had the misfortune to find a way to do it.” Well, Fermi was the first to release this energy in a controlled way – and it didn’t smash him to pieces. When he wrote this, he had just completed his laurea, the highest academic degree in Italy at the time, at the age of only 20 – even then, this was unusually young. During this time, he also worked on the statistics of ideal gases, leading to the famous Fermi-Dirac-statistics in 1925. The same year, he became one of the very first Italian professors for theoretical physics at the Sapienza University of Rome, aged 24. In the 1930s, he switched to experimental physics again, bombarding elements with neutrons, including thorium and uranium. He found that slow neutrons which had been ‘moderated’ were more easily captured by other atoms than fast ones. From this finding, he developed a diffusion equation, known today as the Fermi age equation. This work ultimately won him the Nobel Prize for “demonstrations of the existence of new radioactive elements produced by neutron irradiation, and for his related discovery of nuclear reactions brought about by slow neutrons”. The ‘new elements’ were actually fission products, but he didn’t know that at the time; later he even added a footnote to this effect to his Nobel lecture. In January 1939, Enrico Fermi arrived in New York and started working at Columbia University’s Pupin Laboratories. That very month, the news that Otto Hahn in Berlin had achieved nuclear fission reached the US; Lise Meitner, living in exile in Sweden, had provided the explanations for Hahn’s results. Suddenly science became extremely political: Fermi was among the first to warn that Hitler’s Germany could possess atomic energy and nuclear bombs. A few months later, his Columbia colleague Leó Szilárd drafted the famous letter to president Roosevelt that was signed by Albert Einstein to the same effect. As a result, the Advisory Committee on Uranium was founded that ultimately led to the Manhattan Project. Fermi and Szilárd had been conducting preliminary fission experiments at Columbia, but by early 1942, the entire team was moved to Chicago to join the Metallurgical Laboratory. 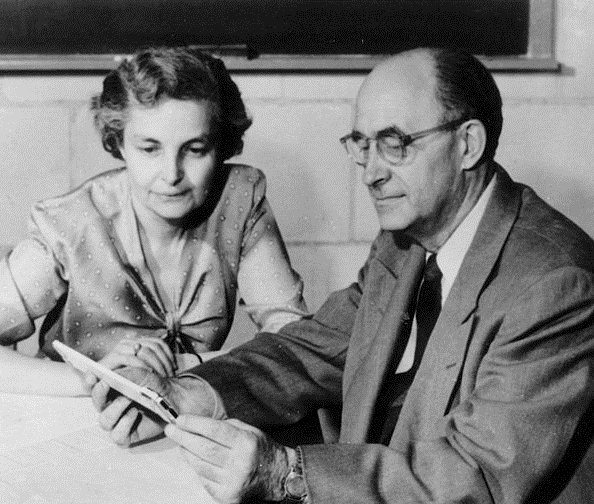 Fermi and his wife became US citizens in 1944, and he joined the Los Alamos National Laboratory the same year, lending his expertise to various reactors of the Manhattan Project. In 1945, he worked again as a physics professor at the University of Chicago and became one of the founders of the Institute for Nuclear Studies, renamed Enrico Fermi Institute after his early death in 1954. 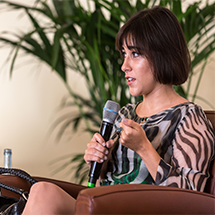 The institute’s focus is not solely on particle physics, but also on astrophysics, among others. 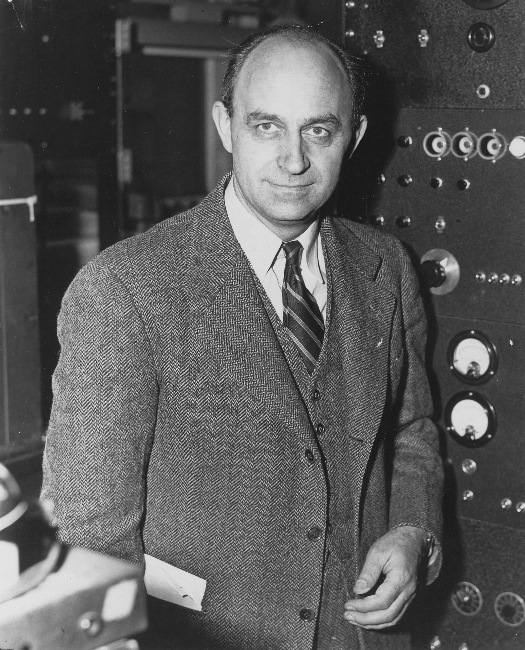 The Fermi National Accelerator Laboratory in Illinois was named after him, one of the largest colliders in the world, also called Fermilab, as well as the synthetic element Fermium (Fm) with the atomic number 100, and the Enrico Fermi Award of the US Department of Energy; the list goes on. Nowadays, Fermi is probably most often mentioned in context with the famous Fermi paradox about the apparent contradiction between high estimates of the probability of the existence of extraterrestrial civilizations and the lack of evidence for such civilizations. Actually, Fermi never published on the subject of alien civilizations, the paradox is merely the result of a lunch discussion in 1950 with Emil Konopinski, Edward Teller und Herbert York, all former Manhattan Project researchers. 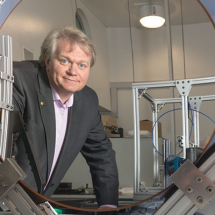 But in the last years of his life, he had become increasingly interested in space research. In 2008, NASA’s gamma-ray space telescope was renamed Fermi Gamma-ray Space Telescope, it studies gamma-ray bursts that are emitted by extremely high-energy explosions in distant galaxies. If you’re a participant of the 66. 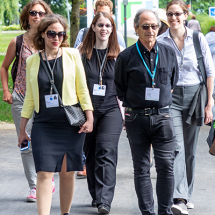 Lindau Nobel Laureate Meeting this summer, dedicated to physics, don’t miss Roy Glauber’s lecture on ‘Recollections of Los Alamos – And the Nuclear Era’ on Thursday, June 30th at 09:30 a.m or later as video-on-demand at the mediatheque. You’ll find the entire meeting programme here.